When you use the Heaven on Earth Starlight Essences you are connecting with the souls of the stars themselves. You are engaging with them, enlisting their light in your own process of spiritual growth. These beautiful souls, and many beautiful beings of light associated with them, love to help. They consider it a joy and part of the fulfilment of a deeper purpose they all share: the journey towards oneness for all life. Before using your essences you may like to consciously invite the help of these stars, going within and requesting that their light and your own light interact for your highest good and the highest good of all. The essences are designed to be taken by mouth a few drops at a time up to four times a day. You can take them undiluted or mixed with a drink. They can be used in other ways too, such as added to a bath or applied to the skin. You can take more than one essence at a time. However you may find that more than three essences used together at the same time can feel a little too ‘busy’. You will probably find that you gain the greatest benefit from taking the essences for several days at least, and perhaps for three weeks or so. Part of the work of the essence is to strengthen the link you have with the souls of the stars so that they may gently assist you in dissolving energy forms that overlay or obscure the qualities they are helping you develop within yourself. Taking the essences before going to sleep can be one helpful way of working with the stars. As you do so, you connect with whichever star or stars you have selected and that assists the star souls to connect with you in the sleep state, when you may be especially receptive. Use these tools to assist your intuition and inner knowing in selecting the Starlight Essences that are right for you. Key Quality Start with the spiritual qualities you wish to strengthen and come to know more deeply. Each star offers subtle frequencies that will help you develop in many ways, but the key qualities summarise particular strengths that the soul of the star brings forward and promotes. Star Name Read about each star and its particular spiritual qualities. You can also use the image of the star to tune into its soul. Energy Centre All the stars selected for these essence assist you to grow spiritually but some have an influence upon particular energy centres or chakras. If you are drawn to develop on of these centres you may find this guide helpful. Select any quality to read more about the star or stars that can help you develop that quality further. The soul of Aldebaran, and through that soul the beings for whom Aldebaran is their home star, have a deep understanding of acceptance and they love to share this understanding. With care they have observed the apparently simple quality of acceptance and come to appreciate how subtle its operation is. For humanity collectively and for many individually acceptance is a quality or indeed a skill that we can very valuably develop. Acceptance, the allowing of everything (including ourselves) to be exactly as they are, brings us to the point of choice. That point of choice is always the present moment. Whatever we are unable to accept will at least to some degree hold us out of the present moment, most often locking us into the past. Interesting it is not only that which we regard as negative that we may find hard to accept. If you are dealing with feels of unworthiness or guilt or shame or fear, you may well find that accepting the love or generosity of others poses a problem. Aldebaran teaches us that acceptance and compassion can be brought to all experience, wherever it might be in time, space or dimension, and release the energy locked within and bring it to us in the present. If you find yourself having difficulty accepting some aspect of your life Aldebaran essence can help change subtle energy flows within your heart centre that ease the process of accepting what is. This essence helps you to find the calm that allows that which has been hidden to move into your awareness, so that you may allow it presence and integrate it with the rest of your being. It reminds you that all comes from love and returns to love, that love is the ground of your being. It supports you in an aura of peacefulness that makes easier the process by which you allow a blending of all energy forms that make up your human presence, the known with the unknown. Alcyone is the great star, the heart star, of the Pleiades. Its love acts as an organising principle around which the other stars of the Pleiades gather to focus loving wisdom outwards to the Galaxy. So the star itself has a deep understanding of clear intention. Part of that understanding is that intention is other than force. Where force may seem important if we are to achieve anything in a physical universe, whether that force is applied internally to marshal all our efforts in one direction or externally to carry our will forward, Alcyone teaches that this Universe has beautiful currents and flows towards manifestation that only reveal themselves to us as we release to need to force the issue. It encourages us to get out of our own way and let our divine selves guide us. We can find so many different currents of intention within ourselves that coming to clarity might sometimes feel elusive. If you find yourself vacillating or indecisive, consider first of all that the time for decision is not yet. Perhaps the vacillation you have accused yourself of is actually a process of rumination or contemplation as your own internal organising principle exploring the options before bringing the best way forward to your attention. Alcyone essence can help in this process by supporting a focus on what is significant as you let unhelpful thoughts and thought patterns fall away. For the stars of the Pleiades and the beings for whom Alcyone is a home star have a deep interest in the evolution of the mental body. From their point of view we can seem a little like automata responding to external stimuli in somewhat fixed ways rather than allowing ourselves to be directed by the divine within. Their observation is that we have tended to be beset by accrued mental patterns of past or learned responses that can easily get in the way of clear intention, almost literally. For they see us as often living in a fog of mental clamour, itself bound up in emotional unease, that makes it difficult for the light of Divine Will to penetrate. They do not judge us for this, recognising it as a condition of our human environment, but they do love to help. As you use Alcyone essence you are opening to that help to whatever degree is right for you. There is a community of beings within the orbit of Alcyone who have a special interest in the Earth and humanity. In many ways, of which Alcyone essence is one, they offer understandings learned from and through Alcyone of the Divine Plan. If you find any hardness in your heart, not matter how justified that may feel, Aldebaran essence helps you soften it. It is as if Aldebaran says to you, ‘Nothing is worth standing in the way of love.’ This star soul and the beings who live in association with it broadcast a message that all things can be embraced with love and from that love will come understanding. The star sees compassion as a powerful force at work in the Universe, one of the primary drivers towards oneness. Altair, the eye of the eagle, looks benignly on us. From the heart of the star come waves of light directed to the heart of your heart centre from which they emerge as waves that move outwards through your heart centre opening it to a deeper knowing of the love that you are and helping it to grow. The beings for whom Altair is their home star and who work in concert with its soul have an abiding experience and vision of love as a ceaseless inflow to this Universe, mediated through the stars and all living beings. Our function, all of us living in this Universe, is to be that inflow in our lives. They suggest to us that it is the movement of love through us (whether giving or receiving) that brings us contentment. When using this essence you may like to support its work by focusing on your heart centre and sensing waves of light gently emanating from its heart. As they move outwards imagine them clearing any blocks that might have held you back from knowing fully that you are love. Perhaps Altair says to us, ‘Why make it difficult when it can be easy?’ This star soul and the beings for whom it is the home star have a deep belief in the efficacy of love. ‘There is no hurry; let love do its work’, is a message they transmit to us. You can use this essence by itself when you are wishing to find solutions or resolutions or to welcome the new into your life. You may also like to use it in combination with others essences; for example Alcyone, if you are helping the mental body, or Aldebaran, if you are helping the emotional body. Used in combination you may find a smoothing out of the effects, with Altair being like oil for the wheels. The action of Almach essence might be likened to a method for finding the needle in a haystack. First, its light spreads out the hay; it soothes, calms and brings us to a stillness. But then it also brings a magnet that draws out whatever has been hidden. In doing so it gives us the opportunity to recognise what has not been recognised before, or has been hidden away for a while, and decide how we might wish to grant it beingness. As you use this essence you may find it drawing to the surface the unknown or unexpected: that like the peaceful surface of a calm sea being broached by a whale, your own calm (which Almach has helped you find) is disrupted. But, like the whale-watcher, recognise that there is a deeper calm that comes through the fulfilment of a wish for peaceful co-existence. All the starlight essences promote integrity, for all help us towards oneness with the Source of All. Alderman is selected to represent this quality because of the way in which it helps us towards the integration of all aspects of our being. Through the essence Alderamin (the name means ‘right arm’) brings from the Source a particular quality of light sometimes called Fohat, that brings potential power into manifest power. This light is electrical in appearance or feel and very dynamic. It works with your energy field to bring your etheric body towards a higher manifestation of itself. This assistance comes in accordance with the Divine plan. If you use this essence, nothing is forced upon you: all change comes at the pace and in the ways that are aligned with your highest good. The beings, drawn from many stars, who oversee these essences are loving. They wish to help us grow in ways we enjoy and are comfortable with. As you use Alderamin essence you may find a sense of very fine, dynamic and creative light arriving through your crown centre and a centre in front of the crown at the top of your brow, about where the hairline starts, sometimes called the high brow centre. The light enters the core of light at the centre of your being and then expresses itself through delicate movements around the core like somewhat like the magnetic field around an electric current. This movement of beautiful flows of Fohat light facilitates the evolution of the etheric body in the direction of greater harmony and integrity. Aldebaran promotes integrity by helping you make peace with all your experiences, whereas Alderamin comes in at a more fundamental level, working with experience as energy forms rather rather as memories. You have such great potential; we all do. Manifesting that potential brings challenges for us all. We might say that manifesting our potential is the fundamental challenge of being human. How to we bring the beautiful vision each being holds in her or his heart to fruition? Alcyone essence helps to bring clarity to our intentions, which you might think of as clearing the path for that innermost vision to enter our awareness and readiness, and then it continues that trajectory by supporting the process of manifestation. There is a great awareness within the many cultures of the Pleiades, led by Alcyone, of the subtle flows of light within the dimensions that make up this Universe. They have a particular interest in those dimensions that we on Earth are engaged with, the physical and those dimensions towards which we are evolving at this time. In these dimensions they observe powerful influxes of light from the Source of All that are bringing great changes. 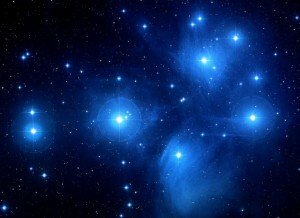 In some ways the existence of the Pleiades is predicated on these changes; these star souls chose to manifest into our Universe in expectation of these influxes, so that they might assist in facilitating the changes they bring. Alcyone, then, has an experience of seeing intention through to manifestation that has great relevance for humanity; and the beings of Alcyone are like elder sisters and brothers to us, so there is also understanding from them of the complexities of manifesting in this dimension. When you use Alcyone essence the star and the beings for whom it is home combine to assist you by transmitting light, especially through the third eye to the light at the centre of your head, that opens up new ways of using your mental body. These transmissions help clear the path between your divine self and your personality self, making it easier for Divine Will to flow through you to manifestation. There is a particular effect on the mental body. At the physical level there is an encouragement towards the development of new neural pathways, especially those that link the right and left hemispheres of the brain. In the mental body itself there is encouragement to recognise mental flows which carry divine bliss. Such flows are very effective in organising thought towards benign and effective action. Antares Starlight Essence can have a liberating effect on the second or sacral chakra. The light of the star flows into this energy centre confirming the expression of joy and aliveness. If you have experienced inhibitions placed upon you, whether by others (in your upbringing, for instance) or yourself (in wishing to please others or to fit in, for instance), this essence helps you to reconnect with your fundamental right to be. There is a recognition from this star of the life that you are and the rightness of that life expressing itself. Beyond this liberating effect can be a further opening to what is truly new to you in the context of your current life. The beings who live in association with this star have been great explorers, travelling vast differences across space, with a particular interest in the wide range of environments that can support life and the many different forms of life and styles of living. Perhaps this impetus to explore and discover came from the soul of the star. Now within the light body of the star are councils which pool all that has been learnt over thousands of years and broadcast that learning through the light of the star to assist all who experience themselves as moving through rapid change or who are wishing to embrace the new. Antares essence helps you tune into that assistance. Aldebaran essence helps you open to opportunity in subtle ways. It guides you through a process of acceptance of what is, leading to a compassion for what is that frees energy previously locked away and comparatively unavailable to you. The soul of the star and many beings associated with the star then transmit a further quality of openness that assists the flow of Divine Will within your being. This flow acts as an organising principle for the freed energy, helping it align with your own higher purpose and ushering towards manifestation in whatever form is most helpful for you. None of this is automatic, for it requires from you a willingness, a generosity towards yourself, that permits you to welcome and enjoy opportunity. This star brings a dynamic, electrical quality of light sometimes called Fohat. This light acts upon the etheric body, bringing units of etheric energy from a condition of being polarised into the energy forms of choices made and choices not made, back to a raw energy state where all is potential. This renewal of energy forms is a different process from that of regression, where past experience is examined and made peace with in order to create change, or the repetition of new patterns to instil change, or the focus on a new vision to bring into manifestation. These may continue to be of value to you; Alderamin comes in at a more fundamental level and so will support these and others ways of renewing yourself. Here, through this essence, Alderamin helps you to recognise yourself as presence, changing by nature, not bound by inertia to repeat patterns of behaviour or experience, but free to transmute etheric forms without reference to past experience and in accordance with Divine Will. For whatever renewal Alderamin helps you create will be respectful of your own highest good. This star is gifted with the purpose of illuminating Divine Will in all beings in this sector of the Galaxy who reach outwards for that illumination. Through the crown and brow centres especially it directs light to the etheric body to restore the innocence of the Divine where that has become obscured or overlaid with accumulation of experience not yet wholly integrated. Alderamin helps the process of integration as part of its service to the higher communities of the Universe and ultimately the Source of All. If you feel drawn to this essence you may find it helpful to focus upon the star itself (you may choose to find the physical star in the night sky, depending on your location and weather conditions, or you can focus inwardly through intention and request), so that you can have a sense of direct connection with the star through the essence. In this way you facilitate to movement of an electrical quality of light from the star to your own etheric body. Through the heart of Antares the star’s soul expresses a deep acceptance, beyond being at peace with what is. This acceptance has a spirit of positive enjoyment, an engagement that is more than contented, for it has discovered understanding through engagement. This essence can be helpful if your own feelings of serenity are elusive or compromised by difficulties in your life or the life of the world around you. Through this essence the soul of the star will encourage you release the need to hide away in order to find peace. You may find it helpful to distinguish the action of Antares from that of Almach by considering Antares as promoting serenity through acceptance, while Almach is helping you recognise the innermost peace of your being. The star that we see in the sky is actually four stars weaving a complex dance. This can be seen as symbolising an apparent paradox in the light we receive from Almach. On the one hand the gravitational pull linking this group acts to draw out that which is within us. On the other hand the balance these souls have achieved between them signals to us a stillness that lies at the heart of all beings. We may resolve the paradox by considering that what Almach is drawing out from us is the knowing of our own stillness and in doing so it may draw our attention to the hidden that has obscured that knowing. We may come to that stillness through resolving contradictions and divisions, but it pre-exists separation and diversity and is not of itself a product of resolution. Almach reminds us of our natural inner stillness of being. You may find it helpful to distinguish the action of Almach from that of Antares by considering Almach as helping you travel to the innermost peace of your being while Antares as promoting serenity through acceptance of all that is. Alcyone essence helps you trust yourself in the sense that the light the essence carries supports the development of communication between between the divine self and the personality self. This communication is primarily within the mental body, but it also provides an environment conducive to the development of neural pathways within the brain, increasing connectivity and consequent flexibility of thought. You could consider the light at the centre of your head being like the heart of the Galaxy and the synapses within your brain being somewhat like the stars. There is a conscious transmission from the star and beings who live in relationship with the star to the core of light at the centre of your being. Such transmissions facilitate access to the light of Divine Will as it manifests in flows and currents in the consciousness of the Galaxy itself. The mental body of human beings has a natural resonance with these galactic flows. As your awareness is drawn more to these resonant flows within the mental body, so accretions of old thought patterns that may undermine your capacity for self-trust tend to fall away to be replaced by a deeper engagement with Divine Will. Antares itself is an enormous star, one of the biggest ever discovered. You might consider that as an outward expression of its welcome. Its light reaches out even at the physical level to embrace the Universe, and its spiritual light also has this quality of warm embrace. There is a sense of generous acceptance that can help you find a deeper level of self-acceptance. It is as if the star encourages you to relax into a warmth towards yourself and whoever you might discover yourself to be. Select any star name to read more about its spiritual qualities. Over many generations a group of Pleiadian beings associated with Alcyone have been holding a focus for humanity, a vision of the peaceful and fluent transformation of human consciousness to its next level. They have a particular interest in the development of new, more open and flowing forms of thought. In the Halls of Learning there is a room with an etheric model of the Earth at its heart. Here this group study the unfolding of the blueprint for the Earth and use their wisdom, their light and their love to transmit through this etheric model to the consciousness of humanity forms of light that, on the principle of resonance, facilitate our journey along our own highest path without altering its direction, just as a catalyst accelerates chemical change without altering its outcome. Opening to the magnificence of your own potential can be helped with this essence. As you use it you may find a deeper recognition of the purpose that brought you to Earth and a cognition of new ways in which you might fulfil that purpose. Alcyone Essence draws your attention to your innate worth, helping you develop the trust in yourself necessary for the realisation of the deepest vision you carry within your heart. It helps to dissolve limiting thoughtforms (you may like to use it for this purpose in conjunction with Capella Essence), and to create a ‘clean slate’ or fresh start in an area where you may have felt blocked or stuck. It may encourage a feeling of rebirth to yourself, a new way of knowing yourself. Alcyone is the brightest star in the Pleiades, which is a young group of stars formed in the last 100 million years. They are about 410 light years away in the constellation of Taurus. It is thought that they will remain together as a group for the next 250 million years or so before moving outwards into the Galaxy. The stars, clearly visible within the nebulosity of star dust around them, ‘glitter like a swarm of fire-flies tangled in a silver braid’, as the poet Tennyson wrote. Alcyone is a brilliant star: nearly ten times the radius of our Sun, it spins more than 100 times faster and emits a thousand time as much light. Start with Orion, the giant-like constellation striding across the winter skies of the Northern Hemisphere. Follow the line of Orion’s belt to the reddish star Aldebaran and about as far again until you come to the cluster of the Pleiades. On a clear night you may see six or more stars distinct within a group that actually comprises several hundred. Alcyone is the brightest. Often known as the Seven Sisters, one myth tells that the Pleiades were the daughters of Atlas (who carried the heavens upon his shoulders). In order to escape from the hunter Orion’s desire for them they turned into doves and flew into the sky to become the stars we see now. For the Inuit, however, the Pleiades were a group of hunters and dogs who chased a bear out onto the ice and on up into the sky where it became Ursa Major; they chase it still. In Sweden they were once known as Suttjenes Rauko (Fur in Frost), referring to a servant turned out in the cold by his master; perhaps the sparkling stars with their background nebulosity reminded them of ice crystals catching the light on a fur coat. Many cultures have given the Pleiades great significance. Early Arabic astronomers gave Alcyone names meaning Central One, Bright One and Walnut. For Indians it was Arundhati, wife of Vashishtha or Brahma who with their six sons are the seven rishis who make up the seven stars of the Plough. The name Alcyone was thought by the ancient Greeks be connected with Halcyon, the kingfisher. In one of their myths Alcyone lost her husband in a storm at sea and the gods, taking pity on them both, changed them into kingfishers. Ever since there have been seven days of calm, the halcyon days, around the winter solstice. Somewhat in the way an atomiser takes a perfume and turns it into a multitude of droplets which then release their fragrance more effectively, Aldebaran helps you turn the continuum of experience into moments, so that you may appreciate their beauty more fully. As you gather that beauty together so you may discover a uniqueness, which might be likened to a fragrance that can transport you into a state of deep inner peace. If you are experiencing grief or disappointment, this essence can help you move through those feelings to a bedrock of compassion for yourself and for your world. It can help too with feelings of frustration; Aldebaran brings a sense of a wider perspective and larger timescale, so that temporary blocks assume a truer proportion. The star encourages a deeper understanding by gently disassembling the constructions we build to make sense of the world, thereby opening us to opportunities we might otherwise overlook. At times of transition you might use Aldebaran essence for several days and then move to Orion Nebula or Sadr. 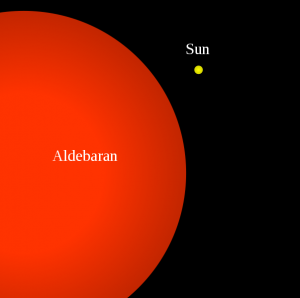 Aldebaran is a big star, far larger than the Sun (see the image for a comparison of their sizes) and the brightest star in the constellation of Taurus, the Bull. 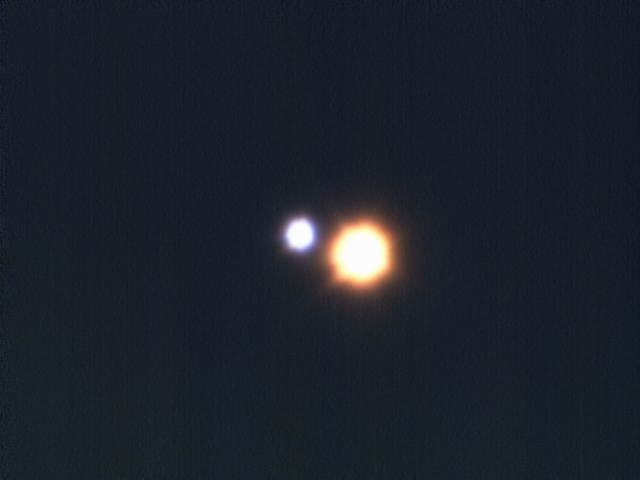 At about 65 light years away it’s a comparatively close neighbour. Within the constellation of Taurus it appears as part of an open star cluster, the Hyades, but it’s actually much closer. It lies near the path followed by the Sun and the Moon as they cross the sky and is regularly occluded by the Moon as it passes in front of it. Aldebaran’s luminosity is considerably higher than that of the Sun, about 425 times as bright, while its surface temperature is a little less than the Sun’s. Over the next few million years it is expected that it will grow brighter yet. It’s easy to find in the winter skies of the Northern Hemisphere. In the constellation of Taurus and distinctly reddish, even to the naked eye, you can find it by following the line of Orion’s belt upwards to the right. 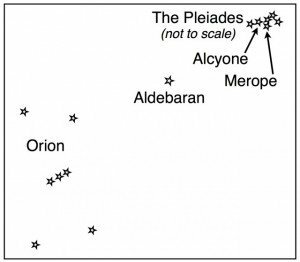 Follow that same line on again and you come to the Pleiades, a small cluster of stars sometimes called the Seven Sisters (top right in the diagram here), though to the naked eye there are generally considered to be just six that are especially bright and easy to see. 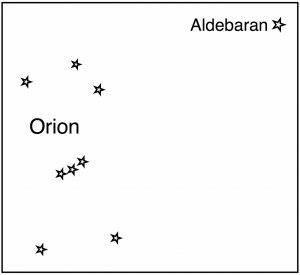 Aldebaran’s name comes from the Arabic Al Dabaran, the follower: that is, the follower of the Pleiades. The name was once applied to all the stars that make up the Hyades group, but over time it became applied solely to its brightest star. Hyades is thought to come from the Ancient Greek huein, meaning ‘to rain’, because their morning and evening settings in May and November were associated with the rainfall common then. The Hyades, who were half-sisters of the Pleiades (themselves often called the Seven Sisters) are gathered within the larger group of Taurus, generally illustrated not as the whole figure of the bull, but just its chest, front legs, head and horns, the latter two being made up from the stars of the Hyades. Consequently in England the star was often called the Bull’s Eye. Taurus is associated with the story of Europa and the Bull, in which Zeus took the form of a bull, seized Europa and carried her off into the sea, which is why the constellation only shows the front of the bull, the rest of his body being hidden in the water. Europa herself (the name is derived from the Greek words for ‘wide eyes’) may represent the Egyptian goddess Hathor, often pictured with the disc of the Sun between her horns. In some Mexican myths Aldebaran is seen as providing light for the seven women giving birth (Pleiades). The lunar month corresponding to October is called Queeto yaao “Aldebaran’s path”. In one Australian Aboriginal myth this star is an ancestor who stole another man’s wife. The woman’s husband tracked him down and burned the tree in which he was hiding and he turned into smoke and rose into the sky to become the star Aldebaran. Alderamin is a star with highly dynamic subtle energy qualities which have a vitalising effect. Its light can be like a spotlight, with an intensity of focus that goes straight through or beyond the superficial or superfluous to identify the Divine in all things. This coming to the point is the product of a deep integrity within the beingness of Alderamin, and so this star also communicates and assists in the process of integration and assimilation, not least in helping you to discern what is life-enhancing and what tends towards inertia or the dissipation of useful energy. Alderamin encourages; it has no belief in defeat because it witnesses the Divine in every moment. You may like to use this essence as a cleanser. You might think of it as bright light shining into dark places, in the sense that it brings renewal to what is congested or confused or lost. In some ways it comes to us like a reassuring adult bringing a light to comfort a frightened child. So you might use this essence to help the child within to grow and to bring nurturing to parts that feel lost or overlooked. If you are working with a dilemma in your life, a situation that feels difficult to resolve or that has arisen unexpectedly, this essence may help you to find the insights and understanding that exist within you. It helps reorganise energy to a greater coherence or integrity. If you have been feeling overburdened, it may help you distinguish true responsibilities from those that are imposed or accepted out of old habit. Alderamin can have a powerful effect on all the chakras, but you may choose to focus especially on the heart when taking this essence as a way of strengthening your connection with your Divine Self. In the constellation of Cepheus, far to the north, Alderamin (derived from the Arabic Al Dhira al Yamin – the right arm) is its brightest star. It lies just under 50 light years from us. Beyond it lies a dense starfield. 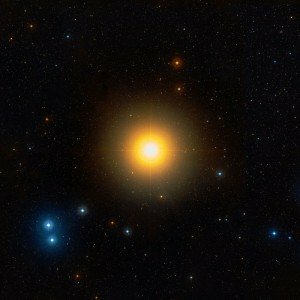 Alderamin is an A-type subgiant on its way to becoming a red giant, located near the precessional path of the north celestial pole (the path drawn across the sky by the axis of the planet). In about the year 7500 it will become our Pole Star having last been in this position round about 18,000 BC. It spins about 125 times as fast as the Sun, which prevents the separation of chemical elements which is common to stars of this class. Our Sun is magnetically active because its outer third is subject to large convective currents. Such convective zones are not generally expected in A-type stars; yet, perhaps because of this rapid spin, Alderamin emits roughly the same amount of X-ray radiation as does the Sun. If you are in the Northern Hemisphere Alderamin is easy to find at all times of the year, as it is close to the Polestar. Use this guide to help you. Alderamin lies in an almost exact straight line from the righthand two stars of the constellation of Cassiopeia, about five times the distance between them. In Greek mythology the several of the constellations around the Pole – Cepheus, Cassiopeia, Andromeda, Cetus, Perseus and Pegasus – are linked. Thus King Cepheus was husband of Queen Cassiopeia and father to Andromeda. Cepheus was told by an oracle to punish his wife for her vanity by chaining his daughter to a rock and leaving her for the sea monster Cetus. Perseus on his winged horse saved Andromeda, who later married him. But Andromeda had been promised to Cepheus’ brother Phineus, who appeared at her wedding with his followers and started a fight. Perseus took out Medusa’s head, turning everyone who looked at it into a stone. Phineus and his followers were defeated, but both Cepheus and Cassiopeia had looked at the head too. Poseidon placed them both in the sky; Cepheus and the zigzag constellation Cassiopeia spending half of the year upside down. Almach essence tells us that we can build a temple from rubble, that nothing is wasted, nothing needs to be excluded from our lives. This essence helps you to blend divergent or incongruous aspects of your life into oneness. The smooth light it brings can make it easier to smooth out the passing bumps on your path and to recognise that all experience is grist to the mill of enlightenment. If you find yourself coming back again and again to something unresolved or irritating, Almach essence can help you to find resolution or release. If you are feeling agitated, whether or not you know the cause, it can help you to find your own inner calmness and to place your current situation in a larger context. In general, you can be helped from any kind of agitated vibrational state, such as fear, over-excitement, anxiety or stress to a calmer, more flowing state of consciousness by this essence. Almach is the the constellation of Andromeda, the third brightest star and marking one of her ankles. The name however derives from the Arabic Al ‘Anak al ‘Ard (“Earth-kid”), a small predatory animal of Arabia, similar to a badger. Although Almach looks like a single star to the naked eye, it is in fact a group of four, the two largest of which can be seen easily in a small telescope. The primary, Almach A, is a yellow-orange giant about 1500 times as luminous as our sun. Almach is in orbit with the bright bluish star, Almach B, with a diameter about 3 times that of the sun, a luminosity of about 170 times that of the sun, and a mass about 5 times that of the sun. Almach B in turn is in orbit with two much smaller stars; quite a complex dance! 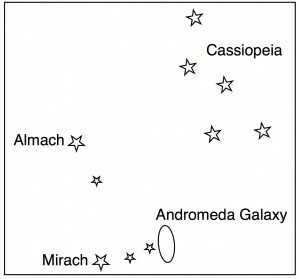 To find Almach look first for the W-shape of Cassiopeia. If you follow the last stroke of the W downwards you will come to Almach at a distance of about three times the length of that last stroke. The destiny of Almach is to act as a template for this part of the Galaxy for how spiritual transcendence may be achieved through the integration of isolated fragments of experience into one unified field of love. The name derives from the Arabic Al ‘Anak al ‘Ard, ‘Earth-kid’, the desert lynx or caracal. But in the Greek mythology from which the name of the constellation derives, Almach is one of Andromeda’s ankles. Andromeda, daughter of Queen Cassiopeia and King Cepheus, is chained to a rock in the expectation that she will be devoured by Cetus the sea monster, but is rescued by Perseus – all these characters themselves form nearby constellations. Andromeda comes to this predicament through no fault of her own, but as a result of her mother’s pride in claiming to be more beautiful than the sea nymphs, who felt such arrogance deserved punishment. When his land and people were threatened by the sea monster and by flood, Cepheus begged for a way to appease the gods and was told to sacrifice his daughter. After the rescue Andromeda and Perseus married and became parents to seven sons and two daughters, rulers and founders of nations. For the Chinese Almach, together with nearby stars formed a constellation known as Tien Ta Tseang, ‘Heaven’s Great General’, with Almach itself ‘The First Star of Heaven’s Great General’. While the Babylonians joined Almach to the small adjacent constellation of Triangulum to form Mulapin, The Plough, with Almach marking the handle to Triangulum’s ploughshare. The light of Altair has a generosity that flows into your heart and helps you to focus on self-acceptance. Altair helps us to enhance this quality, blending it wonderfully with the clarity we might associate with the eye of an eagle. As the light of Altair comes into the heart centre it finds the frequency patterns that give rise to feelings of contentment and gently draws our attention to them. The star communicates that we are seen, recognised and accepted. It helps an internal process of relaxation that in turn promotes easier change from one state to another. The beings of the Altair system have a deep understanding of the potential we have as humans for the sustained experience of joy. Altair essence provides a very good foundation for change; the light of Altair communicates a generosity of spirit and helps you move into resonance with this quality. If you wish to become free of previous limitations of perspective or inherited ideas or belief systems, Altair can help bring you into the now with the realisation that you are a beautiful presence on Earth, without any need to justify or explain yourself. If you have been busy, without time to fully integrate your experiences and to understand what you have learnt from them, Altair can assist you to come to rest and to allow the process of integration to continue naturally, at its own pace and free of stress. If you are wishing to initiate some kind of change in your life Altair can help you prepare. You might like to use it in combination with Arcturus and a third essence, such as Sirius if the change you are looking for relates to accepting more of your soul or Divine Self into your life or Betelgeuse if you are releasing past issues. These are simply examples; for Altair essence combines well with other starlight essences, gently amplifying and supporting their positive effects. Altair is the brightest star in the constellation of Aquila, the Eagle. The name Altair is derived from the Arabic an-nasr at-ta’ir (the flying eagle). It forms one corner of the group of stars known as the Summer Triangle. Another of the stars forming the Summer Triangle is Vega, with a similar look to Altair, but on the other side of the river of stars that make the Milky Way. In a number of cultures this has given rise to stories of lovers forced to live on opposite sides of a great river. In India, Altair with the stars on either side of it, Beta and Gamma Aquilae (Tarazed and Alshain), are sometimes thought to be the footprints of the god Vishnu (see photo). The star itself has a very rapid rotation, such that it is considerably wider at the equator than from pole to pole. It is distinctly bluish in appearance and lies about 16.8 light years away, making it a near neighbour. One of the easier stars to find, since under most conditions the three stars that make up the Summer Triangle are very obvious, because they are much more prominent than the stars around them. The Summer Triangle too is clearly visible in the northern hemisphere through Autumn as well. If you are not sure, you may find it helpful to start with Cassiopeia’s distinctive W and then move rightwards across the sky from that group of stars until you see a big triangle with Altair as its lowest corner. If conditions are good you’ll also see that the Milky Way runs behind this triangle, with Altair floating upon it. Another of the stars forming the Summer Triangle is Vega, with a similar look to Altair, but on the other side of the river of stars that make the Milky Way. In a number of cultures this has given rise to stories of lovers forced to live on opposite sides of a great river. For instance, in the Chinese love story of Qi Xi, the star Deneb marks the bridge of magpies across the Milky Way over which the lovers Niu Lang (Altair) and Zhi Nü (Vega) meet on one special night of the year in late summer. In India Altair with the stars on either side of it, Beta and Gamma Aquilae (Tarazed and Alshain), are sometimes thought to be the footprints of the god Vishnu. This essence is different from the others in that it encapsulates the light of not one or a few, but billions of stars. It gathers their collective essence, both for the essential quality of the galaxy itself and as a contrast to our own Milky Way galaxy. It can be hard for us to step outside the familiar context of our lives; so much that we take for granted may in fact be a product of our particular circumstances. The light of this, one of the closest galaxies to us and a familiar neighbour, can help us to find a fresh perspective. Our galaxy and the Andromeda Galaxy might be thought of as siblings, perhaps as yin and yang, male and female. They are drawn to each other and it is said that some humans have incarnations in both. As well as offering us that opportunity to step outside of the habitual, this galaxy has its own unique qualities; to connect with the heart of Andromeda can be to meet a profound tenderness, aided by the good wishes of many beings for whom this galaxy is home. The consciousness of the Andromeda Galaxy, as you might expect, has an immensely wide perspective in time, space and dimensions. That grand vision might be likened to creating a vast piece of music in which billions upon billions of beings sing together to create more and more beautiful harmonies. When you are looking for a completely fresh perspective or understanding this essence can help you. But it does more than that, for in offering a new viewpoint it also assists in reconfiguring internal relationships, so that your innate capacity for inner peace is strengthened. In addition immense goodwill pours from the galaxy to us here on Earth, helping you increase your own ability to express goodwill and encouraging you to receive the goodwill of others. So, if you are in a situation where goodwill seems lacking, you may find this essence helps to create a shift. The essence is useful too where you have a sense of one phase of life (or a major aspect of your life) having come to a close. It can help you create a fresh start, a clearing away of any debris left over, so that a new, broad and sound foundation can be built. In creating a new start you might use it in combination with Merope where there is an emphasis upon healing; with Sadr for an emphasis on purity; with Alcyone, Orion Nebula or Capella for an emphasis on creativity. Here is the Andromeda Galaxy, magnificent, huge, very similar in structure to our own Galaxy and, at more two million light years away, it’s the furthest object that can be seen with the naked eye. In a Universe in which most galaxies appear to be moving away from us, Andromeda is unusual, for it is drawing closer – at about 100 kilometres per second. It is expected to collide with our own Galaxy in about four and a half billion years. Collision is not disastrous; so vast are the spaces between stars that two ‘colliding’ galaxies may pass through each other without damage, sometimes capturing stars from one another before separating out again. It is speculated that our two galaxies may actually merge to become one super galaxy. To find the Andromeda Galaxy (M31) look first for the W-shape of Cassiopeia. If you follow the last stroke of the W downwards you will come to Almach at a distance of about three times the length of that last stroke. Then follow the line of stars from Almach to the next bright one, Mirach. (The line of stars continues in the same general direction, forming the leg, spine and head of Andromeda.) Close to Mirach are two smaller stars which lead to the galaxy. The galaxy is not very easy to see with the naked eye, except under very dark skies, not because of its size (five or six times the diameter of the full moon), but because of its faintness. If you find it, you will be looking just at its brightest central area. The earliest record of the Andromeda Galaxy is in the work of the 10th century Arabic astronomer Al Sufi. He referred to the galaxy as ‘Little Cloud’, a simple description of its appearance. So far I have not found any myths or fables associated with it, but since its significance as an ‘island universe’ has only been recognised historically within the last century, this is perhaps not surprising. Select any energy centre to read more about the star or stars that can help you to evolve that centre. All of these essences work with the crown centre. Your crown centre is a primary doorway for higher frequencies of light to enter and interact with your energy field. The souls of the stars use the crown to help you access more of your inner light. 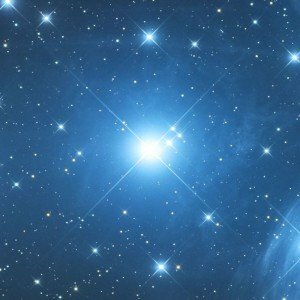 Starlight moving through the crown enters the core of light that connects upwards to your soul and beyond, and then each star engages in a different process, the unique gifts of that star interacting with your energy field in ways that respect your own integrity. However there are particular essences that you may find helpful if you are wishing to open the crown centre and to ease its development. Alderamin brings a very fine and dynamic light through the crown that helps the crown centre itself awaken to more of your soul’s presence. This electrical light facilitates the flow of spirit, which you might consider as a medium where your soul thrives. This lesser-known energy centre is situated about where your hairline begins. It is sometimes seen as having a light like a full moon. Some sources associate it with the nervous system. Opening it gently can help a sense of inner peace. Alderamin essence helps to open this centre. If you are using this essence you may experience light coming in through the crown and through the high brow centre. You might consider the light through the crown as primary and that coming through the high brow as secondary, or a reflection of the primary light. So we might suggest a relationship between these two centres as being somewhat like the relationship between sun and moon. Another way of understanding the action of Alderamin is to observe a direct flow of light through the crown into the core of light that connects all the major centres, and then a vortex being instigated through the high brow centre to distribute and organise this light throughout your energy field. Alcyone has an experience of seeing intention through to manifestation that has great relevance for humanity; and the beings of Alcyone are like elder sisters and brothers to us, so there is also understanding from them of the complexities of manifesting in this dimension. When you use Alcyone essence the star and the beings for whom it is home combine to assist you by transmitting light, especially through the third eye to the light at the centre of your head, that opens up new ways of using your mental body. Antares can have a liberating effect on the second or sacral chakra. The light of the star flows into this energy centre confirming the expression of joy and aliveness. If you have experienced inhibitions placed upon you, whether by others (in your upbringing, for instance) or yourself (in wishing to please others or to fit in, for instance), this essence helps you to reconnect with your fundamental right to be. There is a recognition from this star of the life that you are and the rightness of that life expressing itself.